Greece has become the storm centre of class struggle in Europe for the duration of this decade. The country has been the site of a relentless economic and political assault by the internal and external forces of neoliberalism. The onset of global recession at the turn of this decade impacted on Greece in the form of a debt crisis, linked to the country’s fast-tracked membership of the eurozone in 2001. The institutions of EU capitalism inflicted a sequence of austerity policies –euphemistically known as Memoranda – designed to make the country’s poorest and most vulnerable citizens pay for the corruption and ineptitude of its ruling class. In response to this ruling class offensive, the Greek subaltern classes have initiated a heroic wave of resistance that has taken multiple forms: general strikes, riots, occupations and, in the electoral arena, the sensational rise of Syriza (the Coalition of the Radical Left), which climaxed with the party’s accession to office earlier this year. 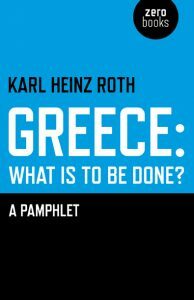 Karl Heinz Roth provides a valuable synopsis of the key events of the Greek crisis in this short but densely argued book. He is also interested in extracting the tactical and strategic lessons the left should draw from the ongoing turmoil. In Roth’s words, Greece has ‘become a laboratory: persons facing extreme processes of expropriation and pauperisation have to make existential decisions that may challenge habitual norms and lead in all sorts of directions’ (86). The author is undoubtedly correct that it is urgent that forces of the radical left in the rest of Europe engage with the theoretical and organisational challenges thrown up by this critical conjuncture. Debates over central questions such as the relationship between reform and the revolution or the nature of the capitalist state that engaged earlier generations of socialists now have to be revisited through the prism of the ‘Greek laboratory’. Roth opens his analysis by demolishing the ruling class narrative that the crisis is the combined consequence of a bloated public sector and a dilatory workforce that had developed an unhealthy dependence on EU hand-outs. The country’s admission to the top table of European capitalism in 1993 was engineered by the forces of neoliberalism even though ‘everyone involved was aware that Greece did not satisfy the criteria stipulated in the Maastricht Treaty, particularly the Treaty’s budgetary parameters’ (3). Roth perceptively notes that the Greek crisis cannot be comprehended on an economic register alone but must also be viewed on the assumption ‘that geostrategic and short-term political goals played a decisive role’ (3). He reminds us that the country’s fast-tracking into the Eurozone club came two years after the disintegration of Yugoslavia and the USSR, and that, consequently, Greece became an essential base for an ambitious attempt by the West to hegemonise regions of South-East Europe that had previously been under Russian influence. Interpreting the crisis as a multi-level one, incorporating factors of class, geopolitics and ideology, puts Roth’s analysis ahead of mainstream commentary of Greece that focus on the economic dimension alone. Outside Greece, there has been minimal coverage of the deleterious effects of EU-imposed austerity on the fabric of the country’s civil society. Most mainstream European commentators prefer to turn a blind eye to the savaging by the EU, ECB and IMF of the infrastructure of everyday life in Greece. Roth, in contrast, draws attention to how a developed Western state has been subjected to the type of economic barrage previously reserved for countries in the southern hemisphere. He describes how a staggering 80% of young, job-seeking Greeks have been forced to move back in with their parents (14); the number of people in absolute poverty has tripled (43); the suicide rate has doubled (46); and the bulk of the population have experienced a 50% drop in living standards (60). Roth vividly labels this the ‘skeletisation’ of Greek society (61). As a German commentator, Roth admirably does not hold back on pointing the finger at the duplicitous role of his own ruling class for stoking the crisis. He describes how shortly before admission to the EU, the Athens Supreme Court had authorised compensation claims against Germany by Greek survivors of Nazi occupation of Greece in World War Two. As part of the deal between the two governments to authorise Eurozone membership that judicial decision was conveniently reversed by Athens (4). Roth underlines the current crisis cannot be comprehended without a recognition of the dark stain of the Second World War on relations between the two countries. Again, it is impressive that despite his nationality, Roth highlights the horrors inflicted on Greece during that conflict. Nazi terror led to 100 000 civilian deaths and left 1 million homeless. 1600 towns were razed to the ground and the country’s socio-economic infrastructure was effectively destroyed (77). The postwar settlement stipulated that Germany should repay Greece for the financial cost but the onset of the Cold War and geopolitical expediency meant that debt was conveniently shelved. Roth calculates that it currently stands at 79 billion euros, making allowances for currency adjustments (78). Not the least ironic element of the present situation is that the German elite throughout the twentieth century has twice managed to evade the economic consequences of aggressive foreign policy, thanks to realpolitik manoeuvring, and yet its latest incarnation in Berlin is now displaying a merciless attitude to extracting debt from another European state. Roth is alert to the hypocrisy of his own country’s rulers: ‘They are living in a glass house and yet they insist on the comparatively small Greek economy repaying its debt at virtually any cost. It is high time to put a stop to the hubris of Germany’s elite and the multilateral institutions supporting them’ (82). The hubris of the German ruling class was apparent through extensive military contracts facilitated between the two countries as part of negotiations in the 1990s.The burgeoning Greek debt condoned by the paymasters of European capital funded 75 billion euros worth of armaments, with Germany profiting the most from orders of tanks and submarines. In fact, Greek military expenditure came to double that of the Germans at one point in the pre-crash era! Roth observes how an intersection of internal and external vested interests coalesced to create this criminal waste of money. German military contractors were obviously rubbing their hands with glee but the expenditure also allowed the Greek bourgeoisie cynically to exploit their historic rivalry with Turkey to justify the astronomical sums involved. Roth laments how ‘German and French defence contractors were the laughing third party and profiteers of this regional conflict’ (5). Another crucial point he explains is that although the German plutocracy has profited from the Greek debacle, the same cannot be said for the working class of his own country. At the opening of this century, the ruling class in Berlin had piloted the austerity imposed on southern Europe on their own population in the form of ‘the agenda 2010 that has been enforced in Germany since 2003-04 and which is geared to the creation of a low-wage sector that aggressively proliferates from the lower to the higher echelons of the working class’ (58). The ability of the Euro elite to manipulate the media presentation of the current crisis into a supposed conflict between prudent Germans and irresponsible Greeks belies the reality of an international elite exploiting an international subaltern class. The military-based chicanery is characteristic of the nefarious capacity of the international ruling class to generate an ideological smokescreen veiling its responsibility for the crisis. Roth expounds how the elite of exploiters can be analysed as being composed of three overlapping sections, all crucial contributors to the unfolding maelstrom of disaster. The native Greek bourgeoisie is made up of family clans who have accumulated wealth and power through their control of the country’s banking, shipping and petrochemical industries. In the 1990s, these closely-knit cliques exploited their political influence to organise tax avoidance on an industrial scale. Corporation tax was lowered to 25%, encouraging ‘a remarkable deterioration in the tax compliance of parts of the conservative upper middle class … the country’s top 30 000 families held more than 250 billion euros in capital assets. Of these, 100 billion alone were held as bank deposits; at least another 100 billion were transferred abroad’ (5). Intrinsically attached to this faction of the elite are an insidious conglomeration of financial, construction and military corporations located in other parts of Europe that profited from the Greek spending spree. These include Deutsche Bank, ThyssenKrupp and Credit Suisse (6). These first two parts of Roth’s gallery of rogues are predictable but some readers may find the third group he identifies more surprising. Pasok was the dominant party of the left in Greece following the fall of the military dictorship – that is, until the recent rise of Syriza. Roth argues Pasok is symptomatic of the decline of Western social democracy due to its craven acceptance of the tenets of neoliberalism and its failure to provide an authentic alternative to predatory right-wing parties. Roth describes a process horribly familiar to the post-Blair British left: ‘Pasok’s reservations about the major entrepreneurial dynasties, the Orthodox Church and the military-industrial complex were dropped. Pasok also entered into an unqualified symbiosis with the ruling elites’ (6) .The spectacular disintegration of Pasok’s voting base among the Greek working class can be largely attributed to this craven willingness on the part of its senior parliamentarians to prostrate themselves before the demands of the EU elite. Roth describes a cancerous growth of clientelism, corruption and greed permeating the higher echelons of Greece’s economic and political establishment and undermining the legitimacy of virtually all the mainstream parties. Of course, this can be seen as part of a global phenemonenon in which the apparent hegemony of neoliberal assumptions has eroded faith in the established structures of capitalist political systems and led to the rise of smaller parties on the margins of the electoral spectrum (including Ukip and the Greens in the UK). Greece has become the starkest example of this democratic deficit. Bourgeois politicians are increasingly powerless in the face of diktats by supra-national bodies such as the Troika. Pasok’s Prime Minister, George Papandreou, at one point sought to iniate a referendum on one of the austerity packages he was presented with by the Troika, but was promptly instructed by his French and German masters that such a course would not be appropriate (22). The logic of this evisceration of the façade of bourgeois democracy was reached shortly after when a Greek banker was installed as head of government with no democratic mandate whatever, but with the approval of the Euro elite in Berlin and Paris. Roth terms these crude tactics the ‘de-democritisation’of Greece, noting the irony that they are appalling in any context but especially so in the country that gave birth to the eponymous concept (67). Not the least of the lessons to be learned from the Greek laboratory is that capitalism finds democratic structures convenient but not indispensable. The situation is clearly full of important lessons for the left in terms of understanding the changing nature of the ruling class in the current era. But equally significant is what we can learn about developing a strategy for socialist politics that might enable Europe’s working class to topple the neoliberal leviathan that now confronts it. Apart from the hollowing-out of social democratic parties such as Pasok noted above, Roth also dismisses far left sectarian posturing of organisations such as the Greek Communist Party that has repeatedly refused to co-operate with Syriza and consequently condemned itself to political irrelevance (86). In contrast, Roth acknowledges the positive role the latter party has played in encouraging the confidence and resistance of Greek workers. He praises the organisation for offering hope to the downtrodden right across Europe, not just within Greece, on the basis of a programme ‘designed to halt the rampant redistribution of income from the lower to the higher echelons of society while restoring social and economic justice and beginning to rebuild the Greek economy in an environmentally sustainable way’ (85). However, Roth is unconvinced by the claim of Syriza’s leadership that such a progressive social policy can be constructed within the parameters of the EU (85). Events since the book’s publication appear to validate Roth’s scepticism about the possibility of advances for the Greek left as long as it retains its faith in the beneficence of the Euro elite. Syriza has been caught in a familiar trap for reformist politicians of rising to power on the back of a mass movement of protest; but then being forced to apply the brakes to the same movement according to the rules of conventional politics. The author persuasively argues a more fundamental rupture is required to significantly challenge the supra-national forces of capitalism, encompassing a revival of the type of upsurges from below that sparked the Arab Spring revolutions and Occupy movement of 2011 (89). Roth takes his sub-title from Lenin’s seminal pamphlet written in 1902; recent events in Greece suggest the ongoing relevance of last century’s most successful revolutionary to the challenges of our time. An excellent review; both book and review provide a powerful summary of the situation in Greece, with a deep sense of the history. The material on the debt, with its indictment of the hypocrisy of the German and EU financial elites in view of the reality of the German “miracle” and its relation to massive debt forgiveness (following both 20th-century World Wars), should be the basis for an international solidarity campaign. Only one caveat: I question the reviewer’s attribution to Syriza of “faith in the beneficence of the Euro elite,” and belief that “a progressive social policy can be constructed within the parameters of the EU.” This faith may be held by some of Syriza’s activists and leaders, but it certainly can not be inferred from their insistence on pursuing negotiations with the Troika and their stated commitment to maintaining membership in the EU — which is, after all, part of the program on which they were elected. Exit from the EU may indeed turn out to be the only route available for Greece, but that could not and should not have been assumed at the outset. Much depends on outside factors, including what the international left community offers in solidarity with Syriza and the long-suffering Greek people.